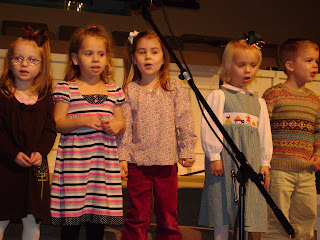 Well again this year, on the night of the Harvest Banquet at church, Avery's Sunday School class sang a couple of songs in front of the church. 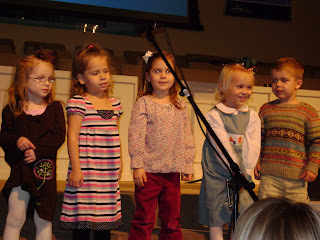 They sang Jesus Loves Me and The B-I-B-L-E. Let me just say I was SO relieved this year when Avery actually sang! If you'll remember, last year she just stood there and stared and didn't sing a single word! I was aggravated mostly because she knew every word to those songs. But thankfully this year she came through and sang really well! Actually they all did. I guess one year makes a big difference. Here are a few shots of the kids. Unfortunately the video we took was on our video camera so there are only pictures to put on here. 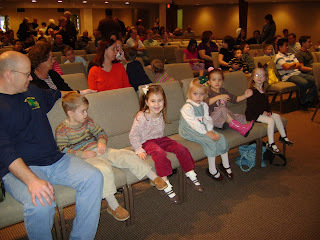 Here are the kids waiting for church to start so they can sing! Cheesing it up before the songs. They did really well! I was proud!